I love walking. I can’t believe I waited so long to start exercising! HImynameisTheresa and I am a moron. The gym at work is intimidating. After months of diddling around, I finally got my paperwork in so that I can use it whenever I want. Two months and I’ve yet to darken its doorstep. It may have something to do with the fact that I am utterly uninterested in packing any more activities into an already busy morning. Because every goddamn morning is secretly a “OMG THERESA WILL BE AT JOB #2 UNTIL 2PM WHAT ARE WE GOING TO DO SOLVE THIS PROBLEM RIGHT NOW” catastrophe, by the time I get to work at 7:30, I’ve already done more than most people do all morning. It may also be because I’m embarrassed about how desperately out of shape I am. The positive side of eating well and refusing to apologize for my shape and size is that I’m no long really embarrassed about being fat. The negative side is that I’ve become very conscious of how bad the situation has become in regards to fitness and my health. Walking, compared to the gym, is a piece of cake. While physically exhausting, it doesn’t require any knowledge of equipment, is easily disguisable as “walking to go some place” as opposed to “fat lady exercising in public,” and fits into my daily schedule like it should have been there all along. I walk before work. I walk at work. I walk after work. And I might just start taking a walk in the evenings. I haven’t spent any time walking for exercise this weekend, and I’m glad I took a few days off. My legs and bottom were SORE SORE SORE. 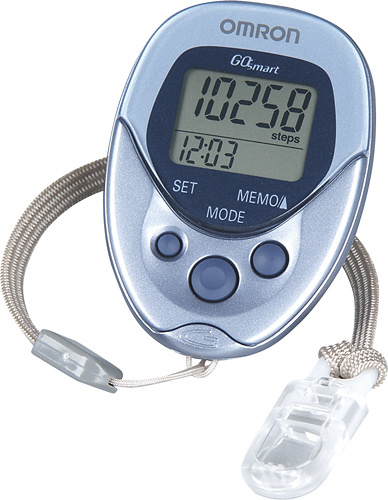 I’m aiming for 10k steps a day, thanks to the handy-dandy pedometer my mom sent me from the States. It’s harder than it looks, but not as hard as I expected. Next Post Zemidjians for Halloween!